This rare TV guide was issued in Mexico on January 8-14, 1968. This common LIS cast shot is featured on the TV guide cover. This is the first time I've seen this particular guide. It amazes me on the many guides that have been issued over the years on this classic TV series. I Purchased this item on 10/22/01 from Josefina Gordero of Mexico. Cover: Guy Williams, June Lockhart, Mark Goddard, Billy Mummy, Angela Cartwright, Marta Kristen, Jonathan Harris, and the Robot. 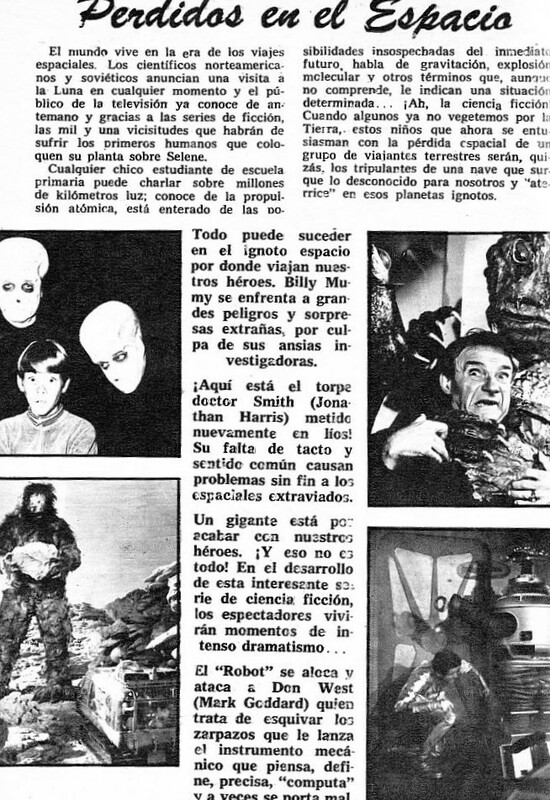 Notes: 1 Page article about lost in Space with 4 small pics in black/white. Also contains some ads for various TV shows: MARINO, WALT DISNEY'S ZORRO, SUPERMAN, BIRDMAN & HERCULOIDS AVANT premeire & more.